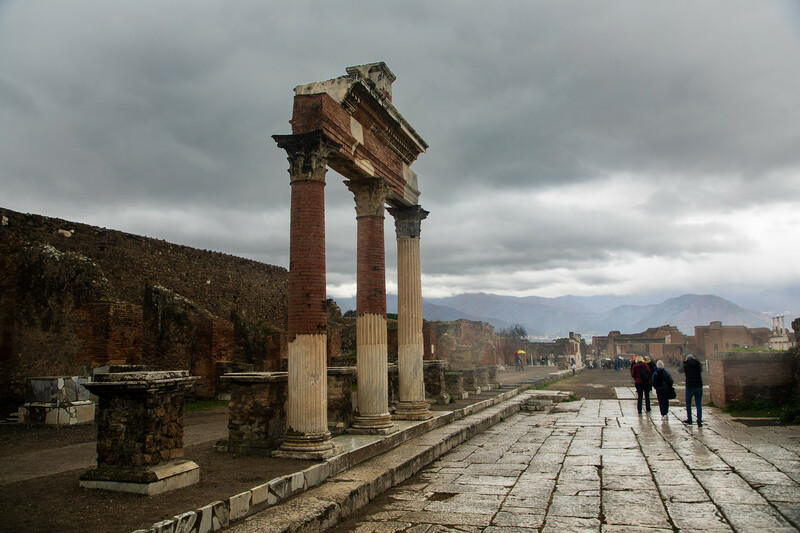 If you are staying near Naples, Italy, a visit to Pompeii is a must see and makes for a great day trip. The site is an incredible memorial to the eruption of Mount Vesuvius which took place on 24 August, AD 79. The city was once a major Roman port town complete with taverns, brothels, sailors hotels and public baths. Its Antiteatro is the oldest known Roman amphitheater in existence. It’s now mostly covered in grass, but at one time, it could hold 20,000 spectators. A bit weird, but in the corridors that circle the arena is now an exhibition dedicated to Pink Floyd, not sure if that’s a permanent exhibit or not though. 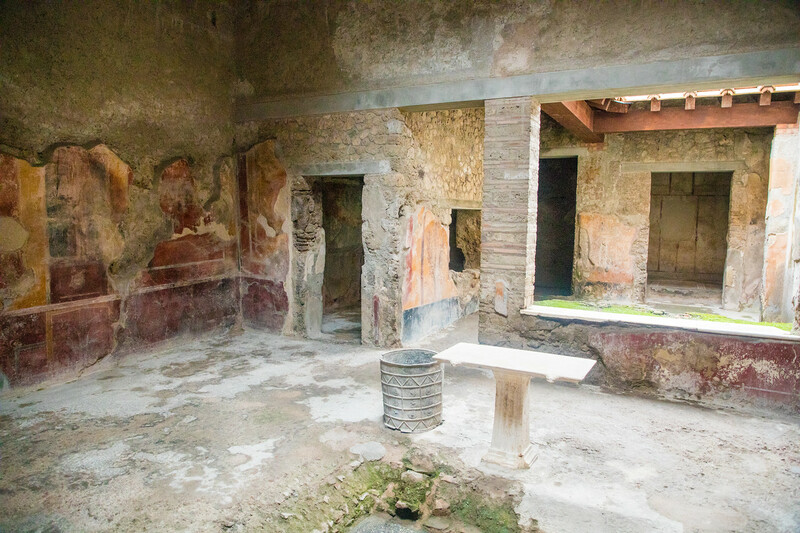 As these images of Pompeii show, it is a must visit place in Italy. 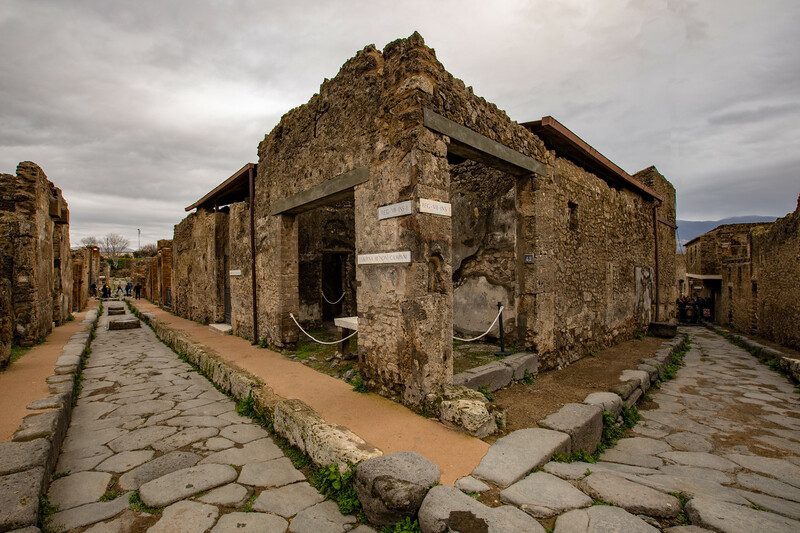 Just off the main piazza, where you will also find the Basilica and the Temple of Jupiter, is one of Pompeii’s saddest sites, the Forum Granary, once the city’s main grain store. 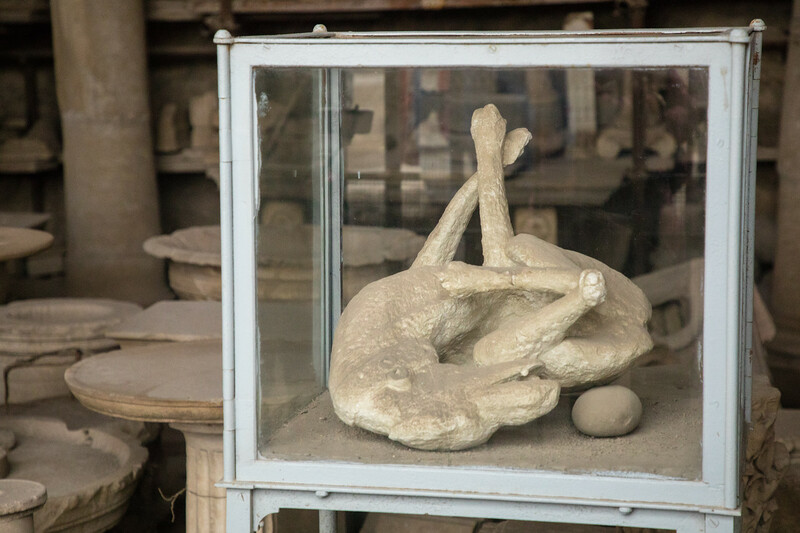 At first glance, it looks like it’s just full of old vases and pottery and other artifacts, but when you get close, there are some casts of human remains, and the famous Pompeii dog is here as well. Away from the main square, it’s fun to just lose yourself and wander the streets. We couldn’t believe how well preserved the city was; it was so easy to picture in your mind what Roman life was like as you strolled along the cobbled streets, passing by homes of both rich and poor, the many tavernas, shop fronts and public baths. Much of the Pompeii art is well preserved, and you be amazed at the detail in the murals. The site is huge, (44 acres) and they are still excavating and finding more. It’s impossible to see everything in one day. It does get crowded, we were surprised how many there were on a rainy day in January, but it’s large enough to escape the crowds. 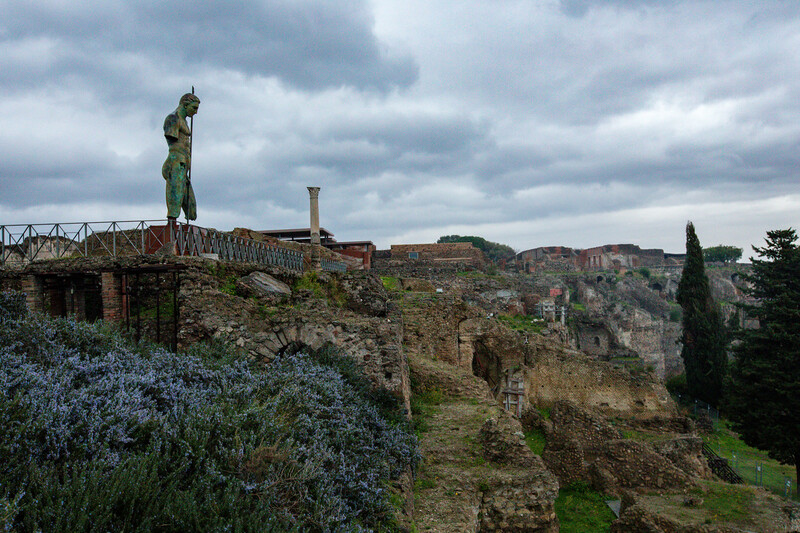 You can get to Pompeii from Naples by train, and it is easily accessible by car or bus. The train station is located right outside one of the main Pompeii entrances. We drove, (driving in Naples is definitely not for the faint-hearted) and there are plenty of car parks nearby. We parked close to the main entrance, probably there were cheaper places to park, but it worked out at €3 an hour. Be careful when driving the last 100 meters to the site, it’s very easy to end up back on the motorway again – we know from experience! 2) Allow at least 3 hours, preferably more. 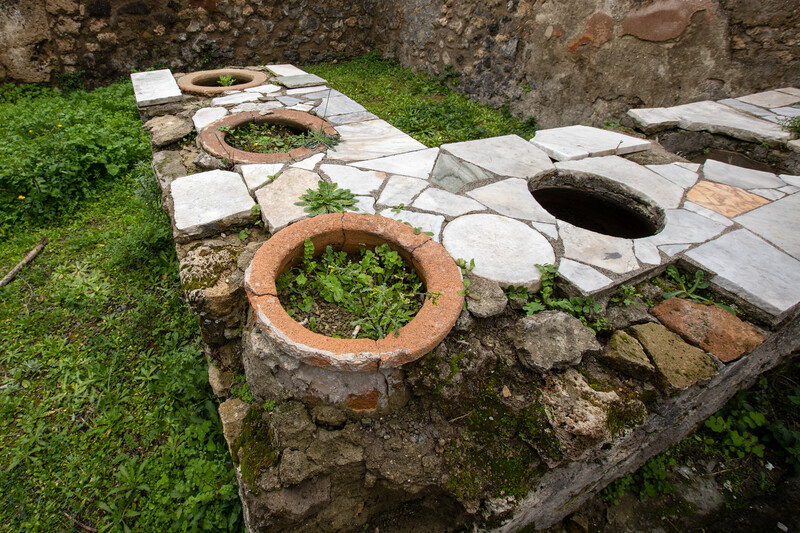 3) You can easily spend a day in Pompeii, so wear comfy shoes. 4) Pick up a free map and information guide at the information desk located next to the ticket booth. 5) The site is open to the elements, and there is very little undercover. So avoid the middle of the day in summer, wear sunscreen, carry water. In winter months, wear warm clothes and be prepared to be rained on. 6) There is a cafe at Pompeii, but it’s nothing special, offering overpriced sad looking sandwiches, but the coffee is good and reasonably priced. So if you are planning to be there all day, bring your own food. Outside the main gates, there are many eateries. Italy is one of those countries we have yet to housesit in. Interesting post.